This Thursday, the great and the good will descend on London to discuss Somalia, a country that has topped the Fragile States Index for eight of the past 10 years. The London Somalia Conference, co-chaired by the UK, Somalia and the United Nations, will be held in Lancaster House, a grand mansion in the exclusive district of St James's. Many of the delegates will stay in swish hotels nearby. This is the third such London gathering since 2012, and there is an element of "cut and paste" to its agenda, which focuses on security, governance and the economy. The official conference document emphasises how much progress has been made. But its description of Somalia from the time of the first meeting still applies: "Chronically unstable and ungoverned", and threatened by Islamist militants, piracy and famine. There has been some improvement. Piracy, which at its height cost $7bn (£5.4bn) a year, is much diminished, although there has been a recent resurgence. US drones, African Union troops, Western "security advisers" and Somali forces have pushed al-Shabab from most major towns, although the jihadists still control many areas and attack at will. A recent electoral process resulted in a new and - for the time being - popular president, Mohamed Abdullahi Mohamed, nicknamed Farmajo, and more female and youth representation in parliament. Somalia is in a "pre-famine" stage rather than the full-blown disaster of 2011, in which more than 250,000 people died. But it is perhaps surprising that the current water shortage will not be a headline topic at the conference. The country is in the grip of its worst drought in decades. Four successive rainy seasons have failed. Even before you enter Burao Regional Hospital, in the self-declared Republic of Somaliland's drought-stricken Togdheer region, you hear the haunting, high-pitched wailing of malnourished children. One boy, dressed in purple, stares blankly at the wall. "His brain is damaged due to a prolonged lack of adequate nutrition," says Dr Yusuf Ali, who returned home to Somalia from the UK two years ago. "He will never recover." According to Unicef, the number of children who are or will be acutely malnourished in 2017 is up by 50% from the beginning of the year, to a total of 1.4 million, including 275,000 for whom the condition is or will be life-threatening. Most are too sick to go to school or help herd animals, making the life of the country's many nomads even more precarious. People are already dying from hunger and diseases that strike those weakened by lack of food. Severely malnourished children are nine times more likely than healthy ones to die from illnesses such as measles and diarrhoea. The World Health Organization says there were more than 25,000 cases of cholera in the first four months of 2017, with the number expected to more than double to 54,000 by June. More than 500 people have already died from the disease. It is not just humans who are suffering. In Somaliland, officials say, 80% of livestock have died. Livestock is the mainstay of the economy - the ports in Somaliland and nearby Djibouti export more live animals than anywhere else in the world, mainly to the Gulf. In south-western Somalia, tens of thousands of drought-affected people have fled to Baidoa, clustering into flimsy, makeshift shelters on the outskirts of the city. This area - known as the "triangle of death" - was the epicentre of the famines of 2011 and 1991. "Al-Shabab is harvesting the boys and men we left behind on our parched land, offering them a few dollars and a meal," says one woman. "Against their will, our children and husbands have become the jihadists' new army." "The biggest problem in dealing with this drought is insecurity," says Sharif Hassan Sheikh Aden, president of South West State, in his modest palace in Baidoa. 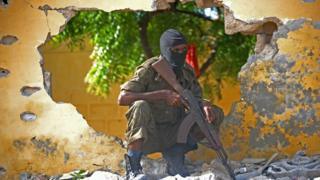 The city, which is protected by a ring of Ethiopian troops, is right in the heart of al-Shabab country. "The militants have closed all the roads so we cannot deliver help to those who need it most." This brings home in the starkest of terms why security is top of the London Somalia Conference agenda. As long as Somalia remains violent, with different parts of the country controlled by a multitude of often conflicting armed groups, it will be impossible to deliver emergency assistance, let alone long-term development. The recently created South West State is one of the regions making up the new federal Somalia. Critics fear this will lead to balkanisation, and risks introducing another dimension to conflict, as the new states rub up against each other and start fighting. This has already happened in central Somalia, where last year there were deadly clashes between Puntland and Galmudug states. The attitude of people in South West State shows how much of a gamble the federal system is. "We have always been marginalised and looked down on by other Somalis," says a farmer, Fatima Issa. "We do not want the federal troops here. They don't hunt down al-Shabab the way our local militias do. We should push for more autonomy, maybe even break away and declare independence like Somaliland did in 1991." One aim of the London Somalia Conference is to push for more progress on the sharing of resources between the regions and the centre. This contentious issue has been debated since before the first London gathering in 2012. South West State has a special friendship with Ethiopia, which is not on the best of terms with the new federal government. This highlights another possible problem - some foreign powers have started to sign bilateral agreements with regional states. For instance, the United Arab Emirates (UAE) is building a military base in Somaliland, a territory the federal government considers an integral part of Somalia. The UAE has also given military hardware to Jubaland State in southern Somalia. Somalia's former special envoy to the US, Abukar Arman, has described the London Somalia Conference as a "predatory carnival", with foreign powers gathering to slice up Somalia for their own benefit. Some in Somalia see it as a waste of time. "It is an expensive talking-shop," says Ahmed Mohamed, a rickshaw driver in the capital Mogadishu. "The politicians and diplomats are obsessed with the conference instead of taking action on the drought." But lessons have been learned, and there is now a far more nuanced approach to Somalia than there was when the crisis began, in the late 1980s. The US response to the Somali famine of 1991 was to send in nearly 30,000 troops. This ended in a humiliating withdrawal, following the shooting down of two US Black Hawk helicopters in 1993. Now, much of the talk is of "Somali-owned" processes, although the shadows of a growing number of foreign powers can be seen lurking in the background.